Painters in London. List of 10 painters and decorators based in London, England. The Leading Team of Painters and Decorators in London with more than 15 years of experience in the painting and decorating business. Services include redecoration of all areas of both the outside and inside of private homes, commercial properties, bespoke wall sticker design and creation etc. Professional painters in London nw6. Offers interior and exterior painting services throughout the areas of London. Services include room stripping and redecorating, exterior decorating, interior decorating, protective coatings etc. Offers commercial painting & decorating, residential painting & decorating, office fit-out & refurbishment services to London and greater London area. Interior and exterior painters and decorators serving the greater London area including Wimbledon SW19, Mortlake SW14, Sutton SM2, Richmond TW9, Battersea SW11, Tooting SW17, Islington N1, Teddington TW11, Raynes Park SW20, Surbiton KT5, Clapham SW4, Balham SW12, Willesden NW10, Highgate N6. Address : 8 Seaforth Avenue, New Malden, Surrey KT3 6JP. Painters and decorators London, specializing in all types of residential and commercial painting and decorating services. Area covers South London, North London, East London, West London. 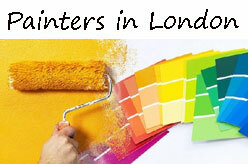 House painter in London, United Kingdom. Friendly and professional painting and decorating company, offers a variety of services to homes and businesses across London (Westminster, Kensington, Chelsea and surrounding areas). Address : Pimlico, London, United Kingdom. Painter in Central London. Office painting and residential painting and decorating service in London. Serving Soho, Covent Garden and the surrounding areas. Interior and exterior painting and decorating services to commercial and residential clients in London. Home Improvement and professional painters and decorators in London. Offers home and office refurbishments, interior painting, exterior painting, wallpaper installation in London. Page updated : 26 April, 2017.